First of all, facial toner should not contain alcohol (denat. ethyl, etc.) since it will completely disrupt your skin's "acid mantle", aka it's natural barrier against bacteria, viruses and other contaminants. Toner should be a gentle, calming step in your beauty routine, since cleansers often leave the skin unbalanced (alkaline) and lacking moisture. 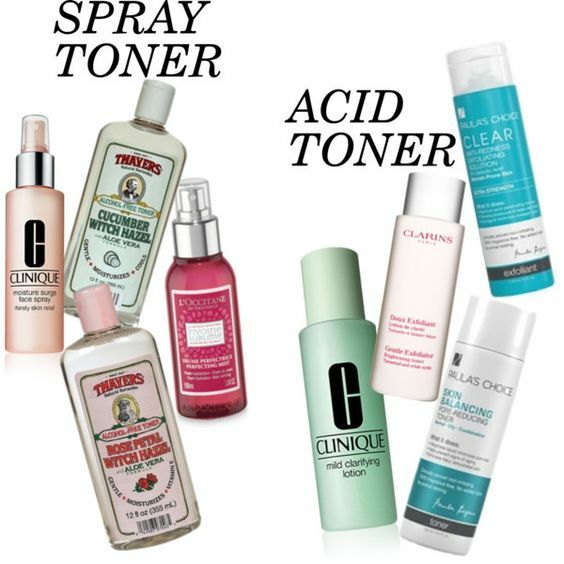 My favourite morning toner is something like the Thayer’s Alcohol-Free Witch Hazel in either cucumber or rose. I like to pour it into a spray bottle and use it as a rejuvenating, moisturizing mist after cleansing, or to set my makeup if it's looking powdery. Anything with rosewater, glycerin, aloe vera, hyaluronic acid, or witch hazel is my favourite, since I find these ingredients to leave my skin looking radiant and free from all irritation. My skin has been hella oily recently, so in the morning I'll rinse my face with warm water then spray with a bit of the L'Occitane Peony spray toner listed below. C'est tout ! At night, I always cleanse (CeraVe, Cetaphil or AmorePacific Enzyme Peel), tone, then moisturize. I often go for a more active toner to help speed up cell turnover and prevent breakouts. My Holy Grail product is Paula’s Choice 2% BHA Liquid, which I will sweep over my t-zone and cheeks with a cotton pad. The Clinique Mild Clarifying Lotion is easier to find, but only contains 0.5% salicylic acid. These acid toners should only be applied with a cotton pad, since you don’t want any of the acid ingredients getting in or around the delicate eye area. When it comes to toners, you can find great options at both high and low price points. I love my Thayer’s Witch Hazel just as much as my Paula’s Choice BHA liquid (I prefer the blue flip-top packaging in the CLEAR line featured below), but they definitely serve different purposes. Always get expert advice when choosing a skincare treatment, but don’t hesitate to take your routine up a notch with this third step. I will never omit my toners now that I can see the difference they make. I LOVE the PC BHA 2% toner. It has cleared up so much mess on my face. Great post!!! So I ended up trying Clinique's Mild Clarifying Lotion and that broke me out. I'm really glad third time's the charm because I've recently started using s Pai toner/"tonic" (wow so pretentious)(jks) and it's really made a difference to my skin! No problem--WE LEARN FROM OTHERS, RIGHT? I ended up getting Radical Skincare's exfoliating pads and Skyn Iceland's Fresh Start mask--both are formulated with AHA and they seem to be good for my skin so far!